In addition to unforgettable life experiences and personal growth, one thing I got out of DEF CON 23 was a copy of POC||GTFO 0x08 from Travis Goodspeed. The coolest article I’ve read so far in it is “Deniable Backdoors Using Compiler Bugs,” in which the authors abused a pre-existing bug in CLANG to create a backdoored version of sudo that allowed any user to gain root access. This is very sneaky, because nobody could prove that their patch to sudo was a backdoor by examining the source code; instead, the privilege escalation backdoor is inserted at compile-time by certain (buggy) versions of CLANG. Question: Do popular JS minifiers really have bugs that could lead to security problems? Answer: After about 10 minutes of searching, I found one in UglifyJS, a popular minifier used by jQuery to build a script that runs on something like 70% of the top websites on the Internet. The bug itself, fixed in the 2.4.24 release, is straightforward but not totally obvious, so let’s walk through it. Cool, we’ve found the minifier bug of our dreams. Now let’s try to abuse it! In the original form, if the config and user checks pass, timeLeft is a negative integer if the token is expired. In the minified form, timeLeft must be a boolean (since “!” in JS does type-coercion to booleans). In fact, if the config and user checks pass, the value of timeLeft is always true unless getTimeLeft coincidentally happens to be 0. Next let’s abuse our favorite minifier bug to write some patches to jQuery itself that could lead to backdoors. We’ll work with jQuery 1.11.3, which is the current jQuery 1 stable release as of this writing. 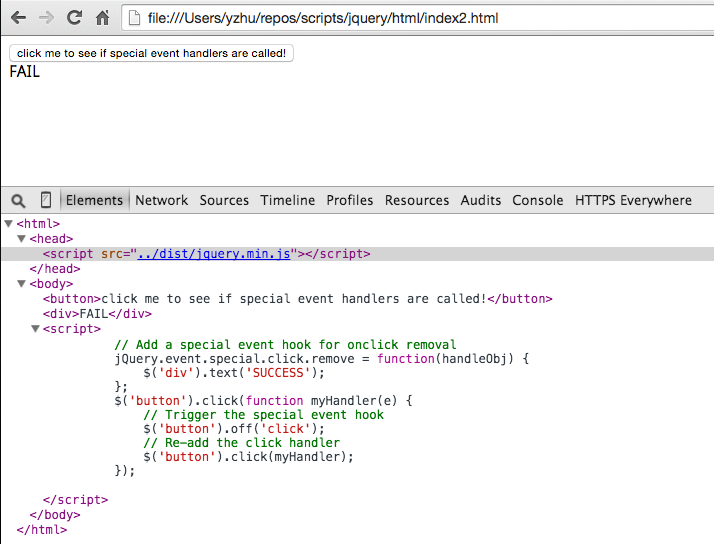 jQuery 1.11.3 uses grunt-contrib-uglify 0.3.2 for minification, which in turn depends on uglify-js ~2.4.0. So uglify-js@2.4.23 satisfies the dependency, and we can manually edit package.json in grunt-contrib-uglify to force it to use this version. There are only a handful of places in jQuery where the DeMorgan’s Law rewrite optimization is triggered. None of these cause bugs, so we’ll have to add some ourselves. 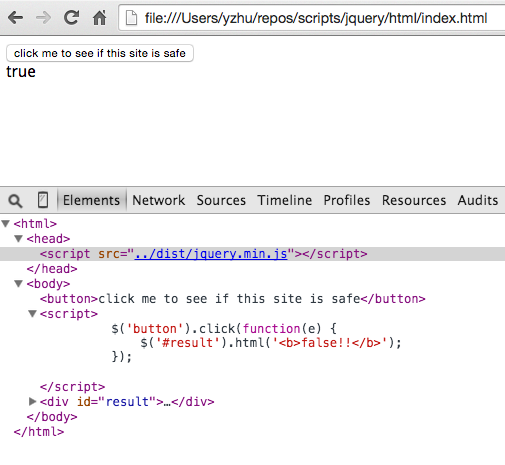 First let’s add a potential backdoor in jQuery’s .html() method. The patch looks weird and superfluous, but we can convince anyone that it shouldn’t actually change what the method does. Indeed, pre-minification, the unit tests pass. After minification with uglify-js@2.4.23, jQuery’s .html() method will set the inner HTML to “true” instead of the provided value, so a bunch of tests fail. 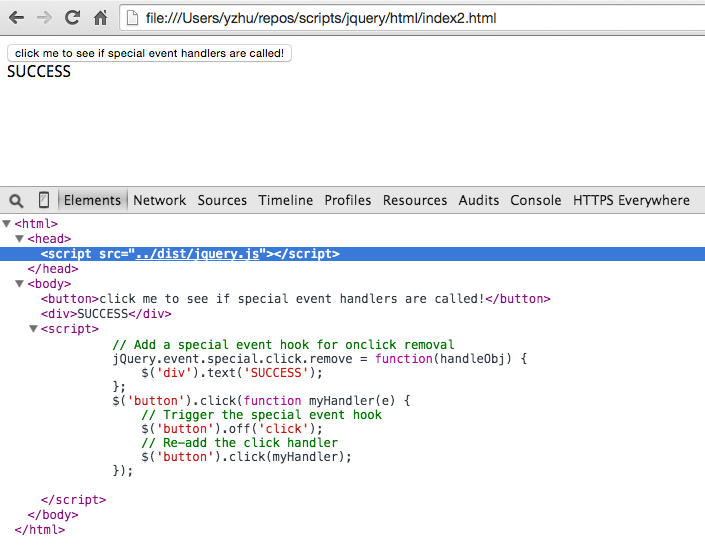 However, the jQuery maintainers are probably using the patched version of uglifyjs. Indeed, tests pass with uglify-js@2.4.24, so this patch might not seem too suspicious. As expected, the user is warned that the site is not safe. Which is ironic, because it doesn’t use our minifier-triggered backdoor. 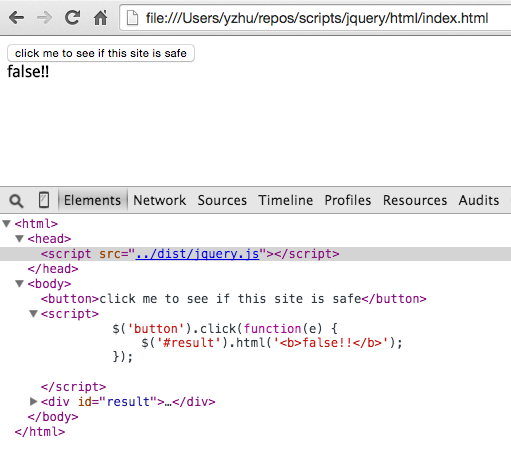 Now users will totally think that this site is safe even when the site authors are trying to warn them otherwise. 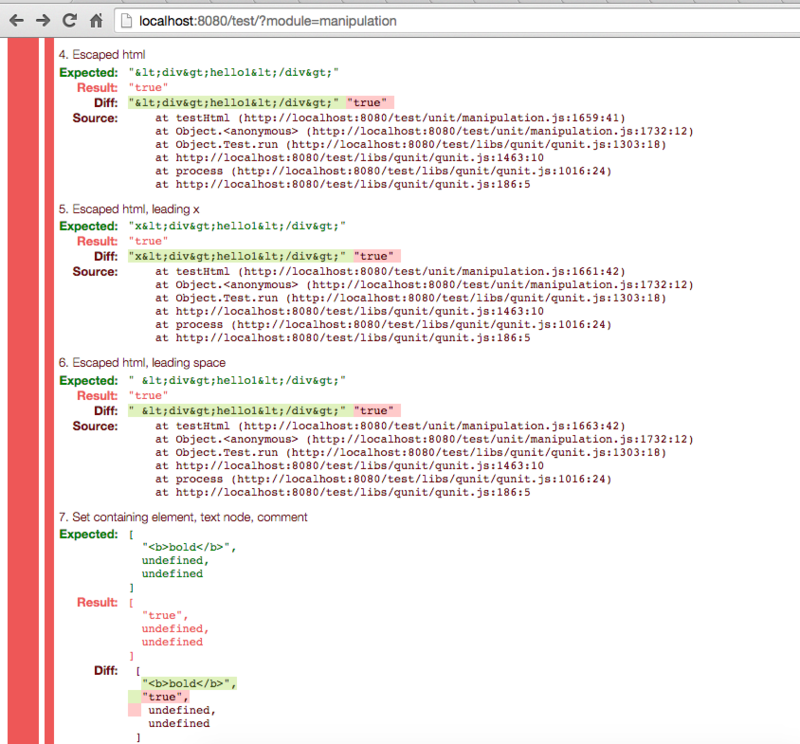 The first backdoor might be too easy to detect, since anyone using it will probably notice that a bunch of HTML is being set to the string “true” instead of the HTML that they want to set. So our second backdoor patch is one that only gets triggered in unusual cases. Basically, we’ve modified jQuery.event.remove (used in the .off() method) so that the code path that calls special event removal hooks never gets reached after minification. (Since spliced is always boolean, its length is always undefined, which is not > 0.) This doesn’t necessarily change the behavior of a site unless the developer has defined such a hook. Obviously this is bad news if the event removal hook does some security-critical function, like checking if an origin is whitelisted before passing a user’s auth token to it. The backdoor examples that I’ve illustrated are pretty contrived, but the fact that they can exist at all should probably worry JS developers. Although JS minifiers are not nearly as complex or important as C++ compilers, they have power over a lot of the code that ends up running on the web. Now, back to reading the rest of POC||GTFO. PS: If you have thoughts or ideas for future PoC, please leave a comment or find me on Twitter (@bcrypt). The code from this blog post is up on github.